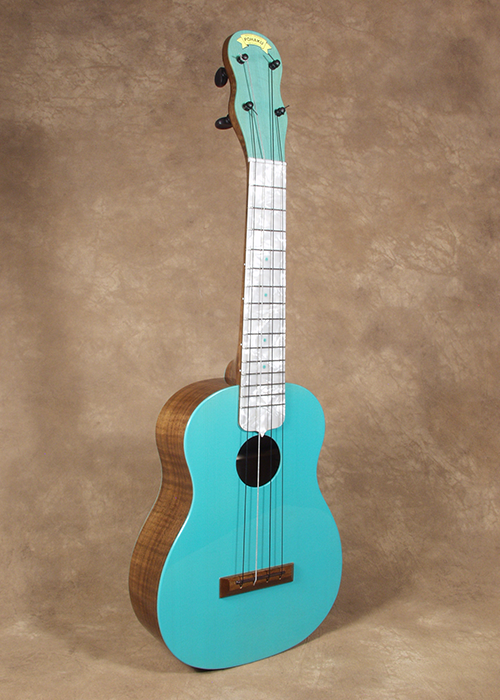 A few months ago I saw a picture of an old sea foam green National Electric guitar in a book which inspired me and got me thinking about making some ukuleles using 50’s deco colors. I decided to make a concert and a soprano each using dark curly wood sides mixed with top & back plates finished in deco colors. I also have wanted to use the Mother of TS pearloid fingerboard treatment and these were great ukes to get the treatment. This concert ukulele has a full ringy sound as I’d expect a spruce topped concert instrument to possess. The playing and action are excellent with perfect fretwork, a silky smooth neck and right on intonation. 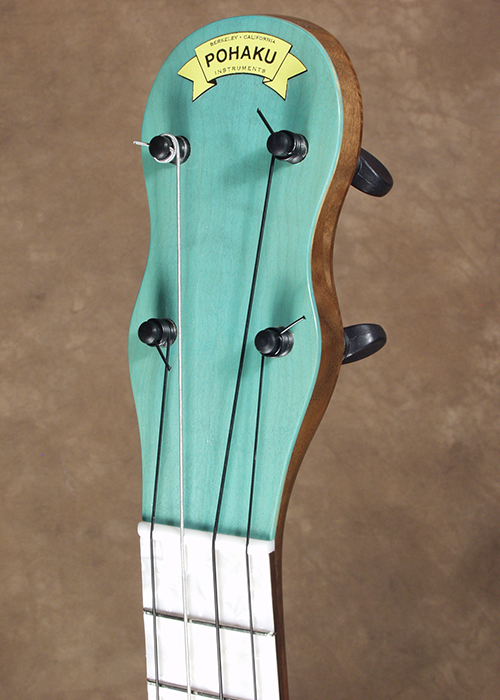 The finish is glossy and flawless; instead of a solid tint the sea foam green color is applied with a see thru technique much as Paul Reed Smith uses on his elegantly finished electric guitars. It’s called a lacquer shader. The green is applied a little heavier on the spruce soundboard and is lighter over the curly maple back and peghead of the ukulele. The instrument has all the usual Pohaku details, a rounded back, smooth neck ferrule, excellently carved neck etc. The strings are tuned to pitch with the nice 4:1 ratio peghead brand tuners and terminate at the pinless style bridge. The rosewood fretboard is covered in a hard pearloid plastic such as is used by some resonator guitar builders. 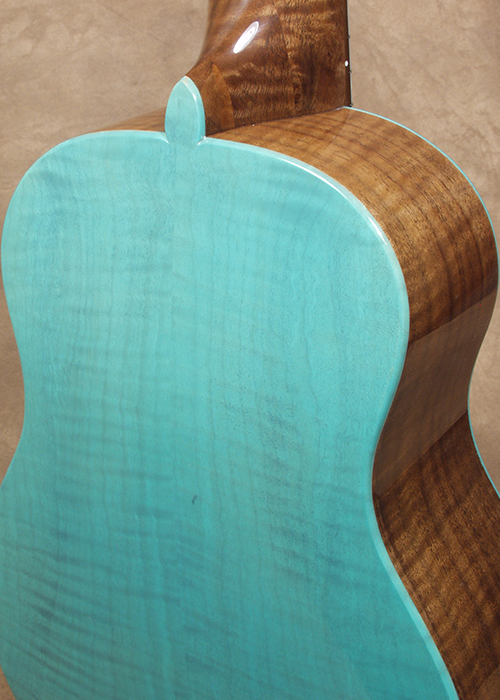 The soundboard is Sitka Spruce, the sides and neck are Claro (California) Walnut and the back is Western Bigleaf Curly Maple. The concert scale length is about 15” and overall the instrument measures approx. 23 ½” long at 18 ozs.